Two billionaires who never fail to get what they want. They both want the same woman. Only one can have her. Ethan, an international steel tycoon with a traumatic past, doesn’t believe he can love a woman, or be loved by one—until he meets Sophia. Alistair, a powerful but guilt-ridden banker, has no trouble finding one-night stands to indulge him in his desire to dole out punishment and appease his tortured soul. Now he’ll do anything to have Sophia—if only once. Sophia, a young, wealthy Brazilian widow with partial amnesia, lives a lonely existence in London, torn between her love for a dead man and the fear of being discovered after a tragic accident. When their paths cross Sophia’s, Ethan and Alistair must each either overcome his guilt, fear, and pain and learn to see himself through forgiving eyes—or finally succumb to misery, alone. Ethan doesn’t believe he’s worthy of love. Alistair doesn’t believe anyone else is. Sophia will prove them both wrong. And then she must make a choice. A sizzling suspenseful romance for fans of Fifty Shades of Grey and Steel Brothers! 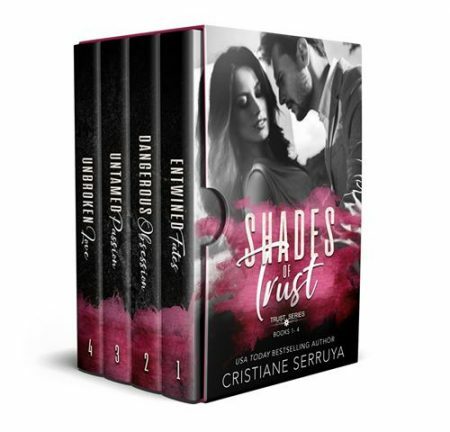 If you like authors Sylvia Day, Maya Banks, Nora Roberts, and Danielle Steel, you’ll love Shades of Trust by USA Today bestselling author Cristiane Serruya!